Food-Borne Illness (food poisoning) from Microgreens? ﻿Do not confuse microgreens with sprouts. Commercially-grown sprouts have had a checkered past because, grown in extreme moisture, in darkness, and in poorly ventilated air, sprouts were a breeding ground for food-borne illness. And the source of those pathogens was the seeds grown outdoors on incompletely composted manures from animals raised on industrial factory farms. Commercial growers of sprouts now all test their seeds for pathogens, and so have eliminated food-borne illness from their products. Incompletely composted manures are the source of food-borne illness even in salad vegetables grown outdoors. But Microgreens are quite different, and have never been implicated as a source of food-borne illness. Both commercially-grown and homegrown microgreens are grown in sunlight or indoor lighting, not darkness. Light, especially sunlight, is a natural sanitizer. And microgreens are grown on sterilized potting soils. Such potting soils are sterilized to eliminate viable weed seeds, live insects or their eggs, and any live pathogens. Furthermore, as a strict vegan, I never use potting soils that contain any slaughterhouse byproducts such as blood, bone, or urine, or any animal manures. No pathogens, living or dead, on my potting soils! 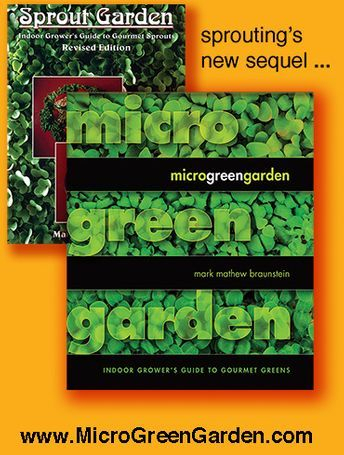 Microgreens can have issues with mold because they are so thickly sown that moisture gets trapped amid their stems and under the canopies of their leaves, but only when they are watered from above. Grow all your microgreens by bottom-watering. When you place the flowerpot of a houseplant into a dish of water, you are bottom-watering. Bottom-watering prevents the trapping of moisture and therefore the growth of mold amid microgreens﻿.